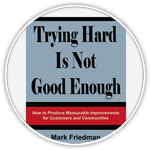 Mark Friedman is a speaker, consultant and author of the book Trying Hard Is Not Good Enough: How to Produce Measurable Improvements for Customers and Communities (2005) available from amazon.com and resultsleadership.org. Mr. Friedman founded and directs the Fiscal Policy Studies Institute (FPSI) in Santa Fe, New Mexico. He has provided training and consultation on his acclaimed Results Based Accountability™ (RBA) framework in over 40 US states and countries around the world. RBA has been used at every level of government and across nearly all government functions. It has been used by a wide range of non-government organizations including United Ways and charitable foundations. The Guardian called the framework “Simple Common Sense, Jargon-free.” In 2009, Mr. Friedman presented the RBA framework at the OECD 3rd World Forum in Busan, South Korea. Prior to founding FPSI in 1996, Mr. Friedman served for four years as a Senior Associate at the Center for the Study of Social Policy in Washington, DC. In 2009 the Center awarded Mr. Friedman honorary status as Senior Fellow. Before working at the Center, Mr. Friedman served for 19 years in the Maryland Department of Human Resources (the State’s welfare and social services agency), including six years as the Department’s Chief Financial Officer. § The Cosmology of Financing: Financing Reform of Family and Children’s Services: An Approach to the Systematic Consideration of Financing Options, Center for the Study of Social Policy, June, 1994. § Trading Outcome Accountability for Fund Flexibility: Negotiating New State Local Deals for Family and Children’s Service Dollars, Center for the Study of Social Policy, December, 1995. § A Strategy Map for Results Based Budgeting™: Moving from Theory to Practice, The Finance Project, Washington D.C., September, 1996. § A Guide to Developing and Using Performance Measures in Results-Based Budgeting™, The Finance Project, Washington, D.C., May, 1997. § A Guide to Developing and Using Family and Children’s Budgets, The Finance Project, Washington, D.C., August, 1998. § Results Accountability for California Proposition 10 Commissions: A Planning Guide for Improving the Well-Being of Young Children and Their Families, UCLA Center for Healthier Children, Families and Communities, March, 2000. 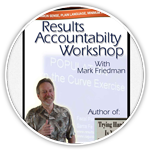 § The Results Based Accountability™ Implementation Guide, March, 2001, on line at raguide.org. 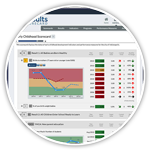 Many of his publications can be accessed through the website: resultsaccountability.com.